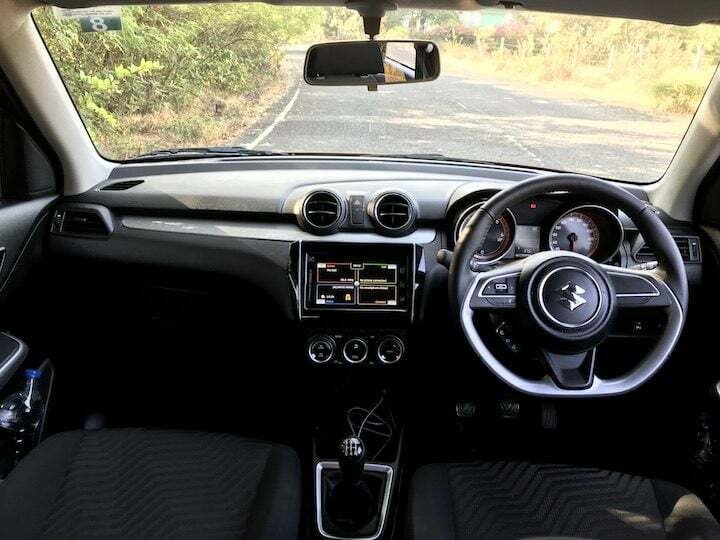 We attended the media drive of the new 2018 Maruti Swift in Lonavala in Maharashtra on 19th & 20th of January 2018 and this post is an experiential review of the new 2018 Swift. 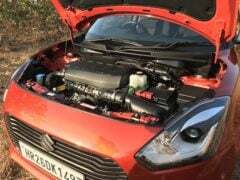 We got an opportunity to get behind the wheels of both the petrol and diesel Swift with both Manual & AGS automatic transmission models. 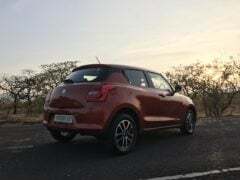 So in total, we drove a total of 4 different engine & transmission combinations- petrol automatic, petrol manual, diesel automatic and diesel manual version of 2018 Maruti Swift. Let us deep dive into 2018 Maruti Swift review with all the practical aspects which matter to a car buyer including the exteriors, interiors, features, mileage, specifications, ride and handling performance. We also discuss whether or not it is a good value for money. The car expected to be prices between Rs. 4.8 Lakhs to Rs. 8 Lakhs ex-showroom Delhi. The new generation 2018 Swift looks quite evolved compared to the previous model. The design still has the signature Swift elements with modern touches. It has a new bolder grille, improved front fascia including LED projector headlamps and DRLs on the top end variants. Move to the side and you can see new shoulder lines, floating roof effect with A, B and C Pillars. 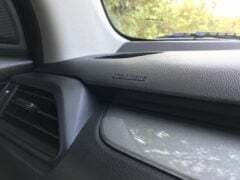 The rear door handles have been moved up near the C-Pillar and it does make the rear doors look neat and more sporty. The new alloy wheels look sporty and smart. The rear of the car is also quite attractive with high mounted stop lamp, side-sweeping tail lamp cluster and new bumper design. 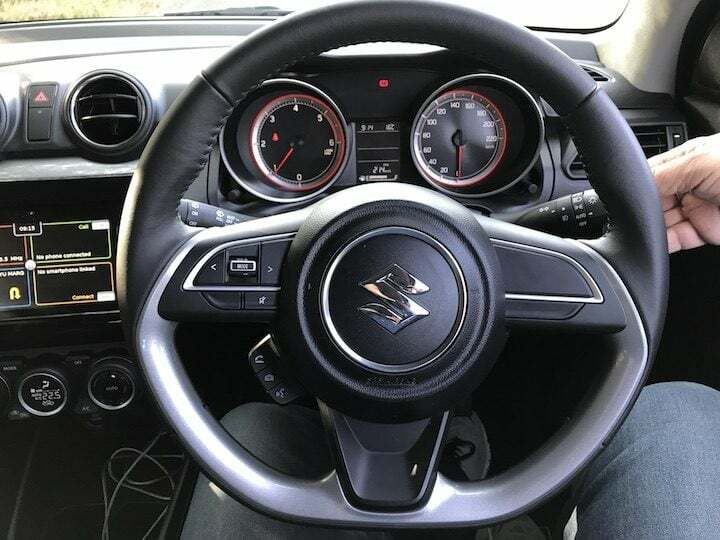 The interiors of the new 2018 Swift are also considerably improved over the previous generation Swift. To start with, the cabin is much roomier now with ample leg room at both front and rear. Space has never been the strong suit of the Swift, but the new 2018 Maruti Swift is considerably more spacious especially at the rear seat. 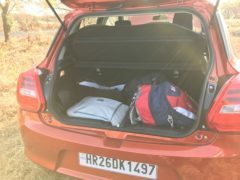 Not only the cabin space, but the boot space has also been increased by around 58 Litres which is roughly 30% more than the previous model. Talking of seating comfort, the front row of seats are very comfortable with ample bolster and shoulder support. The bucket style seats go well with the sporty character of the car. The rear seats are comfortable too for 3 passengers as the width of the car is also increased. Both the wheelbase and track of the car are larger compared to the previous model. 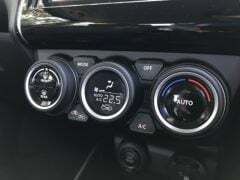 The dashboard, instrument console, multimedia system and climate control system are all very nicely finished. The top-end variants (Zxi/Zdi) get the touchscreen infotainment with Apple Car Play and Android Auto support, Bluetooth and phone features. 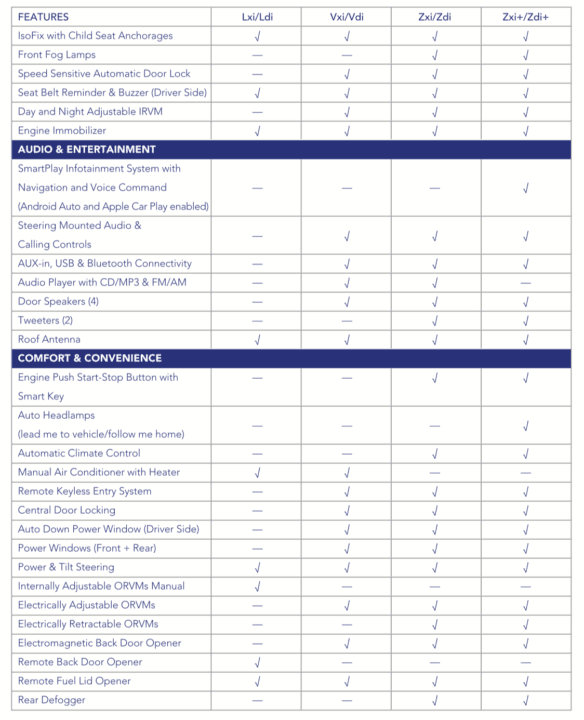 Steering wheel audio and phone controls on the mid and top-end Vxi/Vdi and Zxi/Zdi variants. Safety features are also quite good with dual SRS airbags, ABS & EBD on the offer as standard fitment across the variants, bravo Maruti for this! There are also ISOFIX child seat mounts provided on the new Swift. 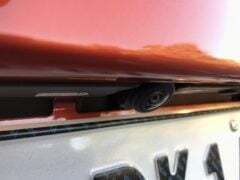 Although Maruti has used high strength heartect platform in this car, which makes it stiff and strong, the lower weight of this car makes me slightly sceptical about how strong it is. 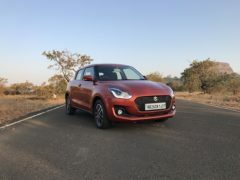 To subside our scepticism, Maruti explained in the product presentation that the new 2018 Swift follows all the collision safety standards as required by law and regulations. Overall, the 2018 new Swift is quite loaded with features compared to other cars in this price segment. 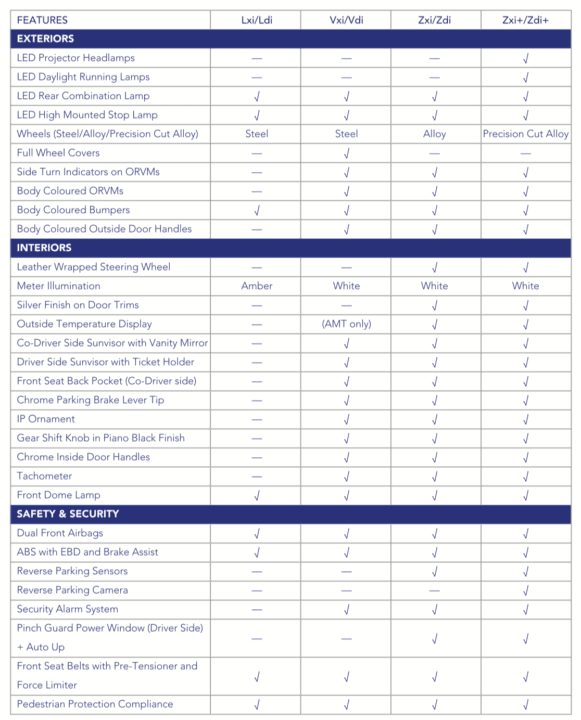 Below is a detailed features list for your reference. The new 2018 Maruti Swift is powered by either a 1.3 Litre DDIS diesel or a 1.2 Litre Petrol motor. 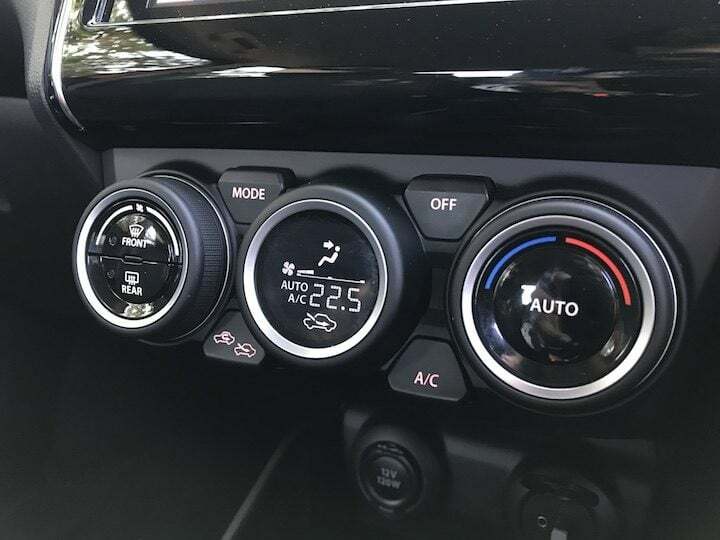 Both these motors come with an option of 5-speed manual or a 5 speed AMT or Auto Gear Shift transmissions. We drove all 4 variants and we will share our views about each of them one by one. The diesel engine is very similar to the previous generation motor. It delivers a peak power of 74 BHP and peak torque of 190 Nm. With the manual transmission, the engine provides a lethargic response under 1500 RPM, after which it improves and beyond 1800 RPM you get a rush of power and torque. 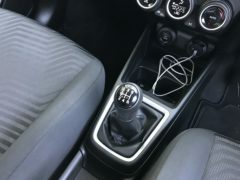 So to keep the car going strong in power band, you have to shift gears frequently. However, once you get used to it, this variant is a lot of fun to drive. The downside is that when you rev higher, the motor becomes noisy. The noise insulation of the cabin is very good, but still some noise seeps in. Overall, this variant is a lot of fun for enthusiasts who live the torque rush of the diesel motor. 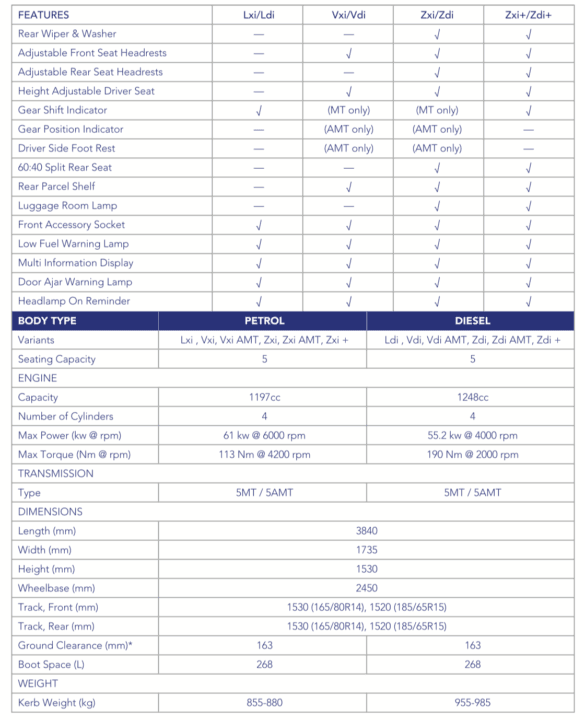 With about 80 Kg lower weight, the diesel variant is not about 8% faster in acceleration as claimed by Maruti. You can easily extract a real-world mileage of over 20 KMPL with this motor even if you are heavy footed, the rated mileage is 28.4 KMPL. 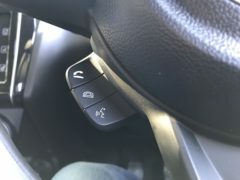 The ASG transmission on the diesel makes your driving way easier by taking away the clutch and gear duties away from you, but the nature of the motor is exactly the same. The good thing though is that in usual driving with AGS, the transmission control unit does not allow engine revs to go below 1500 at most times, so the car always feels full of power and response as the effect of turbo lag is not observed, but the gear shifts are not super smooth, you get to feel it and there is no-head-banging unlike older generation AMTs, but it is not as seamless as we found it on the petrol AGS model. You can easily extract a real-world mileage of around 22 KMPL with this variant. The petrol motor on the 2018 Maruti Swift produces 82 BHP of peak power and 113 Nm of peak torque. This engine is very refined, quiet and responsive. It is a very rev happy and linear engine and does feel like a breeze to drive. The power delivery pattern is very pleasing and throttle response is great. The petrol manual transmission is a lot of fun to drive especially if you rev it over 2000 RPM. You can easily extract a real-world mileage of over 17 KMPL with this motor even if you are heavy footed, the rated mileage is 22 KMPL. 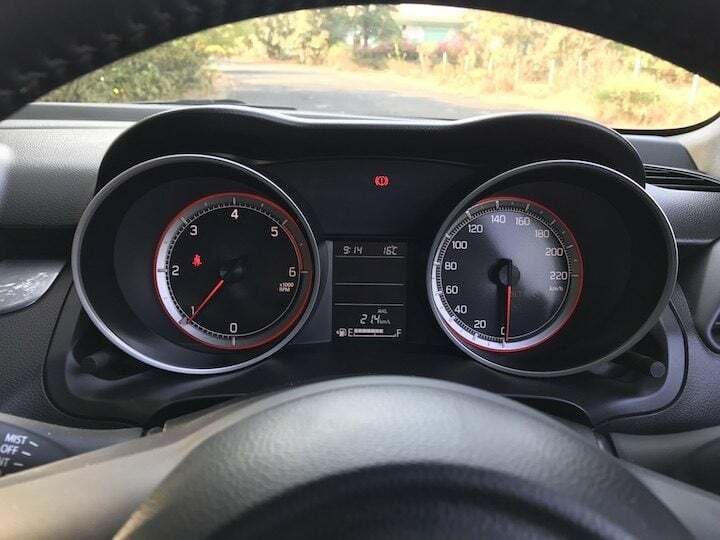 The petrol AGS version uses the same motor at the petrol manual, but here the transmission is automated, hence there is a lot of ease of driving. Couples with a rev-happy 1.2-litre petrol engine, the gear shifts are quick, seamless and very appropriately managed. Since the engine is very agile and responsive, the AGS works beautifully with it and it is hands down the best variant among the 4 variants we tested. 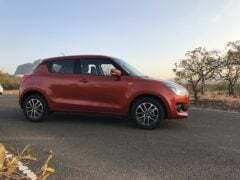 If you want to get the new 2018 Swift, my recommendation is to go for the petrol AGS and you won’t regret it. 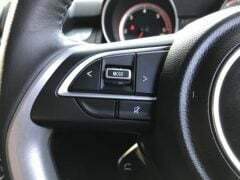 If you feel like driving with a lot of precise shifting control, you can always use the M or the manual shifting mode wherein you can control when the gear changes, however, with my time with the car, it does decipher my throttle input and need for an urgent rush very accurately and does the downshifts very smoothly and aptly. You can easily extract a real-world mileage of around 16 to 18 KMPL with this variant. Ride and handling is the strong suit of Swift and it has not changed. 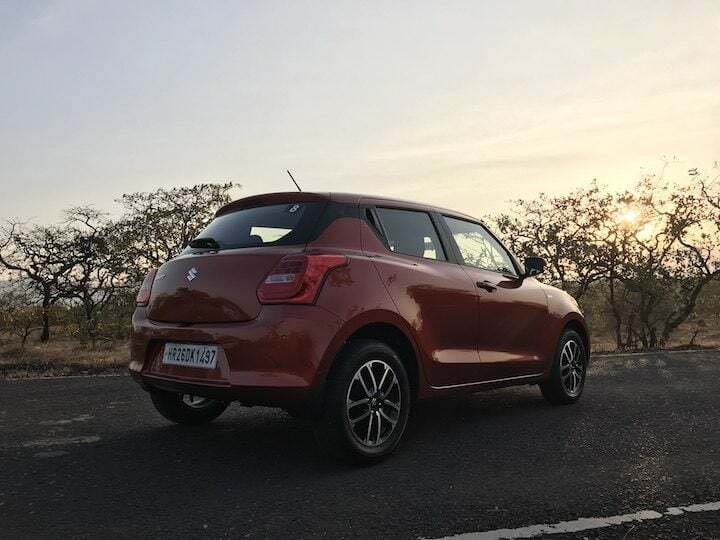 Although the new Swift is more close to the Baleno than to old Swift, it still retains its sporty character to the core. It has a stiff suspension suited for enthusiastic driving. The handling is very sharp and spot on. There is no body roll, no drama around the corners. The car hugs the road beautifully even at triple digit speeds and remains very pliant which is confidence inspiring. We totally loved the driving feel of this car at high speeds. 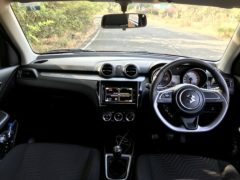 The steering is quite sporty too with a lot of road-feedback and smaller turn required to turn the wheels. If you want a sporty car, this is probably the best car in the segment to go for. 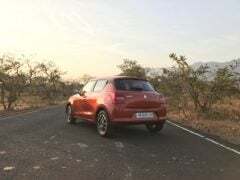 If you are in the market for a small and sporty car, 2018 Maruti Swift is a very good package. It drives great, has addressed the space issues that were present in the previous generation, it is powerful, premium, sporty, spacious and a lot of fun! Need I say more? Do let us know your thought in the comments section below.